In the section above about choosing a route, I suggested that you don't think like a motorist. Well, that's mostly true. However, when you're out bicycling on the street, the safest way to travel is as if you're operating a vehicle. The California Vehicle Code (CVC), and generally the traffic regulations in most other states, essentially considers a bicycle to have the same rights and responsibilities as a motor vehicle. That's something too many cyclists forget. Ride in the street. It's safer. Bicycling on the sidewalk also creates unnecessary enemies for bicyclists. Respect pedestrians, seniors, and people with disabilities. Keep out of their space when you're on your bike. Know your bicycle. The best way to improve your bicycling safety is simply to bicycle more. Take your bike to a quiet street or park and practice riding. Learn how your bike handles: how it stops, accelerates, turns, and shifts. Gaining confidence in your bicycle handling skills will greatly improve your safety. Keep it working. Many bicycle crashes result from equipment malfunction. Keep your bike well-maintained and you will avoid many problems. Pre-ride inspection. Before you ride, give your bike the "ABC Quick Check": Air, Brakes, Crankset, Quick Releases. Make sure your tires are inflated, brakes are good, chain is in the chainrings and cogs, and that quick releases are closed. Be seen. Ride predictably, with traffic, where drivers can see you. Stay in the traffic lane, maintain a straight line. Never ride against traffic; wrong way cycling is extremely dangerous. Be heard. Communicate with motorists, pedestrians, and other cyclists with hand signals, bell, and horn. Make eye contact with motorists, to be sure they see you. Smile when motorists yield the right of way. Be assertive. Timid riding invites abuse. You have a right to the road. Claim it. Define your space. Don�t be bullied. You have the same right to the road as an automobile. Many cyclists ride as close as possible to the parked cars on their right, frightened that an overtaking vehicle won't see them or won't wait until its safe to pass. Problem. The most frequent accident for urban bicyclists is "dooring," a collision with an open car door. Claim your space. Be alert. Watch for hazards: potholes, debris, open car doors. Anticipate. Be familiar with your route. Speed kills. Going fast on a bike is thrilling. But don't ride at a speed beyond your capabilities. Ride in control at all times. Be smart. Obey traffic laws. Or the law of traffic. Know your limits. Again, be assertive. Take the lane! Traffic law doesn't require a cyclist to pull over every time a car approaches from the rear. You only have to be as far to the right as you consider necessary to safely operate your bike. If there's road debris, broken pavement, another cyclist or anything in the extreme right that makes you uncomfortable, move to the left. You have the right to the entire lane! Take it. You're far safer having the cars behind you than crowding you while they pass. Give yourself a cushion. Define your space. Don't be timid. Assert your rights. Bicycling is safe. Sedentary couch potato lifestyles kill far, far more Americans than pedaling. 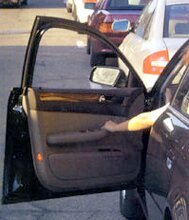 Image: Open car door, great threat to bicyclists.